The first practical way of carrying out quantum cryptography using a mobile phone has been developed by researchers at Nokia and the University of Bristol in the UK. Quantum cryptography – which allows messages to be sent with complete secrecy – is currently limited to banks and other organizations that can afford to have expensive and extremely sensitive quantum-optical components at both ends of a communications link. What the Nokia/Bristol team has done is to work out how to perform "quantum key distribution" (QKD) using simple and potentially inexpensive "client" electronics that could be integrated within a single chip. QKD is a popular quantum-cryptography technique that is already being used commercially. It allows two parties – usually called Alice and Bob – to exchange an encryption key, secure in the knowledge that the key will not have been read by an eavesdropper (Eve). This guarantee is possible because the key is transmitted in terms of quantum bits (qubits) of information, which if intercepted and read are changed irrevocably, thus revealing the actions of Eve. The new system, which gets round several practical barriers to implementing quantum cryptography in portable electronics, has been developed by Anthony Laing and colleagues at Bristol's Centre for Quantum Photonics (CQP) and at the Nokia Research Center in Cambridge, UK. It uses a variant of QKD called reference frame independent QKD, (rfiQKD), which was developed by Laing and several other team members. It solves one big restriction with conventional QKD methods: that they only work if Alice and Bob measure the properties of photon qubits – such as phase or polarization – relative to a fixed reference frame. The advantage of rfiQKD is that it allows for some twisting and turning – even if this relative motion is unknown. The technique works by having Alice and Bob each compute a specific combination of observables whereby the effect of the twisting angle cancels itself out. According to Laing, this "angle independent" value can be thought of as the purity of the quantum state exchanged by Alice and Bob. When it falls below a certain threshold, the pair is alerted to Eve's spying presence. Jeremy O'Brien, director of the CQP, believes that the system could ultimately make it possible to use quantum cryptography to protect the growing amount of personal information, such as passwords, that is transmitted using mobile phones. Automated teller machines, for example, could be set up as rfiQKD servers and a user could simply point their phone at an optical system to receive a quantum key. "This is the first real prospect of putting quantum technology in the hands of the average person," says O'Brien, adding that Nokia – which together with the CQP has patented the technology – is now looking at how it could be engineered into a mobile device. In the new system, Alice is described as a server because she sits in a fixed location and performs all the delicate measurements required for the rfiQKD. Bob is described as a client because he performs simple and robust actions that can be achieved using a portable device. First, the server creates a very weak pulse of light that is sent to the client using an optical fibre. The client takes the weak pulse and passes it through an attenuator, which outputs a single photon. The client then sets the polarization of the photon and sends it back to the server via the optical fibre. 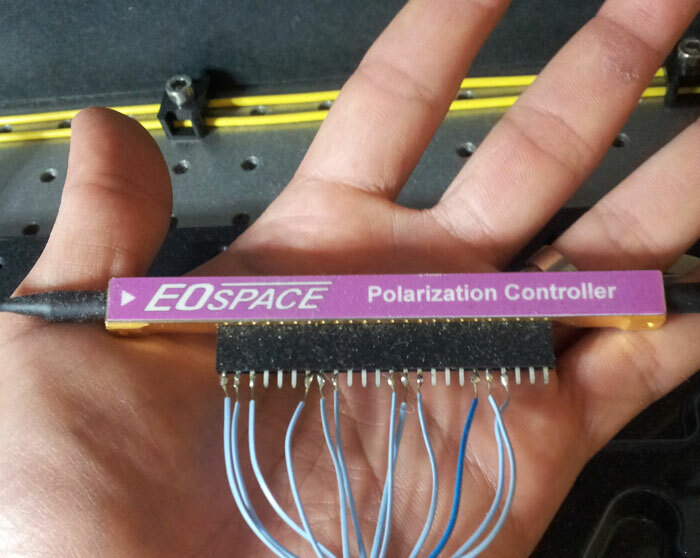 The server then measures the polarization of the photon. Then, the client and server compare their measurements using a conventional link, which allows them to extract both the cryptography key and the purity of the link. The team also implemented a well-known conventional QKD protocol called BB84 on its system. While BB84 began to fail as the alignment of the client and server was allowed to drift over time, rfiQKD held up. The team also found that rfiQKD was able to rapidly recover from noise intentionally introduced to the communication link at a debilitating level, while BB84 continued to fail. The research is described in a preprint on arXiv.